You’ve probably noticed the up-tick in winter content here. For Elizabeth and I along with many other bike commuters, Winter just got cranked up to Eleven this week, despite the fact it’s still officially “Autumn”. We’re hoping that these posts help newer commuters cope with the weather change, and encourage bike commuters to expand their foray into the cooler climates. We also welcome the sage advice of others in the comments. Continuing with our winter theme: Keeping those feet warm. The toes are further from your heart than any other body part, and they spend most of their time close to the snow and slush. Here are some suggestions for keeping those feet warm. Ditch the clipless. The big metal plate found inside most clipless-ready shoes acts like a giant heat sink. You can try putting in extra-thick soles and other tricks like that, but clipless shoes will always cool your feet pretty quickly. I usually end up switching to a completely different bike with platform pedals. It’s also easier to catch yourself before you eat snow if you don’t have to punch out of your clipless pedals when (not if) things go badly. Shoe Covers. Elizabeth has mentioned them several times. 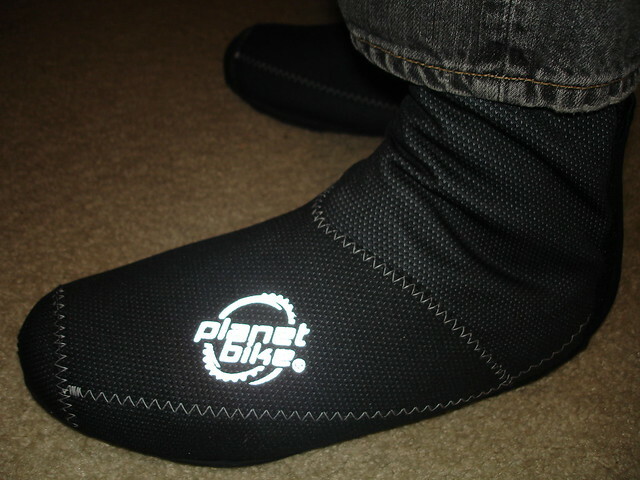 These neoprene or rubber covers zip over many different styles of shoes. They block out wind and water, and help hold the heat in that your feet naturally radiate. Many of them are designed to be compatible with clipless shoes and pedals, so if you really don’t want to sacrifice the “connected” feel, you can probably find a set of covers that will work for you. Layer up. Wool socks are thick, and often one single layer of wool will do wonders. I know a few cyclists who wear one or two layers of wool socks with cycling sandals (no, really!) year round. A good, wicking technical sock closest to your skin with less expensive cotton socks can also work. I really do prefer wool or wool/polyester blend socks this time of year, though. Plastic grocery sacks. I learned this trick from Warren during my first winter of bike commuting. Take part of a grocery sack and put your foot in it before you put it into your shoe. Sometimes, I put this layer of plastic in between two layers of socks. Either way, it works to block the wind, but I only use it on the coldest of days, else my feet actually get too hot and can’t breathe. I’ve also seen cyclists (mostly the urban homeless variety) tape or rubber band grocery sacks around the outside of their shoes. I wouldn’t do it, but you can try it if you want. It might keep your shoes dry. Loosen your shoelaces. A LOT. Even without the extra layers of socks, many shoes worn somewhat snugly will impact circulation to your toes. Loosening them up a bit will help. This is even more important when you’re adding layers of socks to your feet, though. Wiggle those toes, and get off the pedals for a bit. If your toes start to go numb, use brief periods of coasting or stopping to wiggle your toes and get the blood flowing. Take one foot off the pedal and flex it around a bit. It usually helps. Air-activated “hand” warmers. I don’t usually have to resort to these, even in below-zero temperatures. I know plenty of people who do, though. As they’re disposable (and frankly, quite expensive for their purpose) I’d urge you to use them as an option of last resort. Also, I find that the lump they make in my shoes is fairly uncomfortable regardless if they’re above or below my foot. Your mileage may vary. 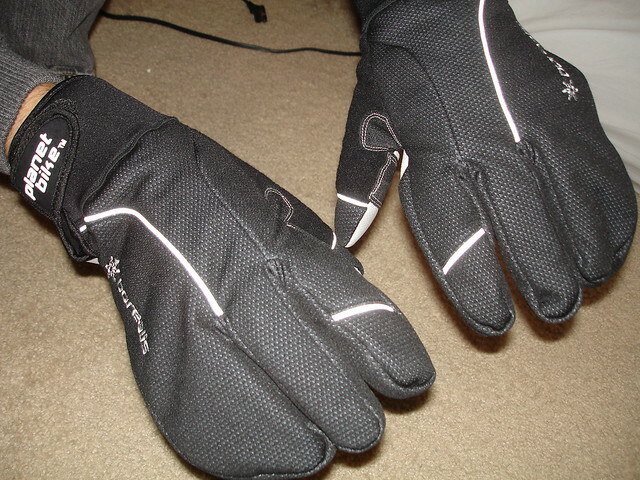 Got any other tips for keeping those little piggies nice and comfy on cold winter rides? Tell us in the comments!